Samuel Johnson was a famous English writer and scholar most known for his ‘Dictionary of the English Language’ as well as a collection of biographical accounts of eminent English poets. In the mid-1700s, Johnson met James Boswell, a Scottish biographer who wrote an extensive biography of Johnson, which, according to a number of experts, is the greatest biography in the English language! This 1793 second edition is exquisitely bound in beautiful leather – an absolutely stunning three-volume set. The most notable aspect of this editions is that it was the last edition published during Boswell’s life. It should also be noted that following the successes of the 1791 first edition, countless letters, stories, and material on Johnson’s life was given to Boswell creating a much lengthier second edition. This 1793 second edition is exquisitely bound in beautiful leather – an absolutely stunning three-volume set. The most notable aspect of this editions is that it was the last edition published during Boswell’s life. 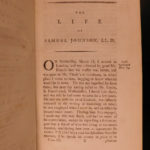 It should also be noted that following the successes of the 1791 first edition, countless letters, stories, and material on Johnson’s life was given to Boswell creating a much more lengthy second edition. The life of Samuel Johnson, LL. D : comprehending an account of his studies and numerous works, in Chronological order ; a series of his Epistolary Correspondence and Conversations with many eminent persons ; and various original pieces of his composition, never before published: the whole exhibiting a view of literature and literary men in Great-Britain, for near half a century, during which he flourished. In three volumes. The second edition, revised and augmented. By James Boswell, Esq. London: Printed by Henry Baldwin, for Charles Dilly, in the Poultry, MDCCXCIII. . Second edition.